While NASA’s Curiosity rover has discovered huge amounts of organic matter in the Gale Crater on Mars, another celestial object has caught the attention of scientists for boasting conditions necessary for harboring life. 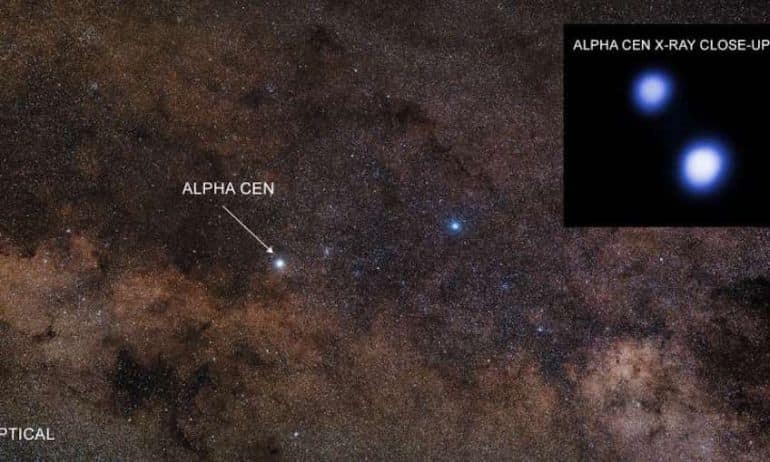 According to a new study published in Research Notes of the AAS, two of the brightest stars in the Alpha Centauri system have passed an important habitability test, one pertaining to X-ray radiation. Situated 4.37 light-years (around 25 trillion miles) from the Sun, Alpha Centauri is the star system closest to the Solar System and comprises three stars: Alpha Centauri A (also known as Rigil Kentaurus), Alpha Centauri B, and Alpha Centauri C, a red dwarf also named Proxima Centauri. With the likelihood of finding an Earth-like planet around Alpha Centauri A or B being as high as 85% as per current estimates, scientists have long observed the star system in the hope of discovering habitable zones. As part of the latest research, NASA’s Chandra X-ray Observatory has been studying the three stars of Alpha Centauri twice a year for the last 13 years. In order to determine the habitability of planets orbiting the stars, Chandra has also been monitoring the amount of X-ray radiation emitted by each into its respective habitable zone. Excessive X-ray radiation, as expected, can make a planet completely uninhabitable by dissolving its atmosphere and creating calamitous weather conditions. Because it is relatively close, the Alpha Centauri system is seen by many as the best candidate to explore for signs of life. The question is, will we find planets in an environment conducive to life as we know it? 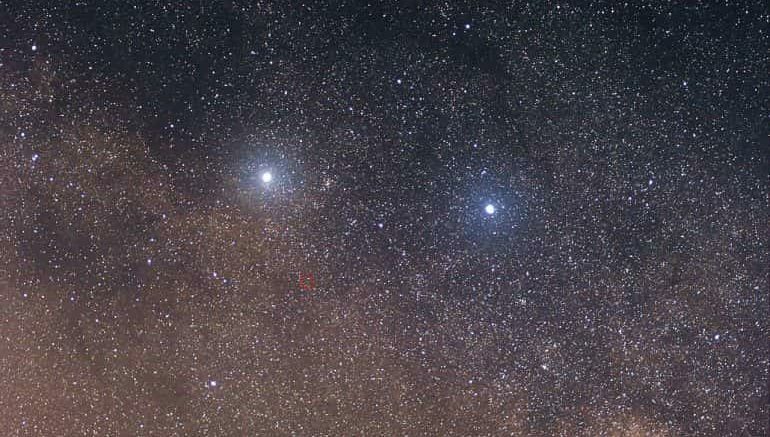 Interestingly, two of the system’s brightest stars – Alpha Centauri A and B – form Alpha Centauri AB, which essentially is a binary star system consisting of two stars orbiting around their common barycenter. While Alpha Cen A bears close resemblance to the Sun in almost every way, including brightness, size and age, Alpha Cen B is slightly smaller and dimmer in comparison. Proxima Centauri, on the other hand, is a small low-mass star that travels around the AB pair, but in a much larger orbit. At its farthest point, Alpha Cen C is over 10,000 times away from the pair than the Earth-Sun distance. However, it is currently the star nearest to Earth, with AB following closely behind. This is very good news for Alpha Cen AB in terms of the ability of possible life on any of their planets to survive radiation bouts from the stars. Chandra shows us that life should have a fighting chance on planets around either of these stars. Proxima, as per the researchers, has a different story altogether. Measuring around one-seventh of the Sun’s actual diameter, it has a mass about an eighth of the Sun’s mass, while its average density is nearly 33 times that of the Sun. Although its average luminosity is usually low, being a flare star, Alpha Cen C tends to undergo random increases in brightness due to magnetic activity. The resulting flare activity, in turn, emits dangerous amounts of X-ray radiation, which scientists believe make the star more hostile to life than its two other counterparts. In fact, Chandra’s findings reveal that the amount of X-rays bombarding the habitable zone around Proxima, on an average, is around 500 times larger than the Earth. During a big flare, it is more than 50,000 times larger in comparison to that on Earth. Given that the only planet that has been discovered in Alpha Centauri revolves around the uninhabitable Proxima, researchers are now doubling down in search of exoplanets orbiting the AB pair. In April 2016, late physicist Stephen Hawking and Russian businessman Yuri Milner joined hands as part of the Breakthrough Starshot mission, whose aim is to build a fleet of chip-sized robotic probes that could reach new stars and solar systems. Although currently at its infancy, the project aims to rely on the use of powerful lasers to launch these miniature crafts into space, which will then embark on a 20-year-journey to the Alpha Centauri star system. An initial funding of around $100 million has already been awarded to the organization, with scientists estimating the final interstellar mission to cost somewhere between $5 to $10 billion.